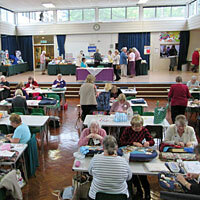 The North Downs Lacemakers 38th Lace Day will be held on the 28th September 2019 (FROM 10:30 TO 16:00) at The Yateley Centre. Our speaker - Michele Carragher Embroidery and Illustrations for Film and Television. Photographs from our previous Lace Days: 2016 Lace Day |2014 Lace Day | 2013 Lace Day | 2012 Lace Day | 2011 Lace Day | 2010 Lace Day | 2009 Lace Day. Venue: Morgan Centre, Crowthorne, 8 p.m. - 10 p.m.
Speaker is David Rose - TBD. Venue: Red Cross Hall, Yateley, 10 a.m. - 4 p.m.
Anna Winter will be the tutor for this workshop. A £5 deposit before the workshop is required to book a place. Please contact workshop organiser for more details. Speaker is Simon Williams - TBD. Please follow this link for events prior to 2018 or in 2018.